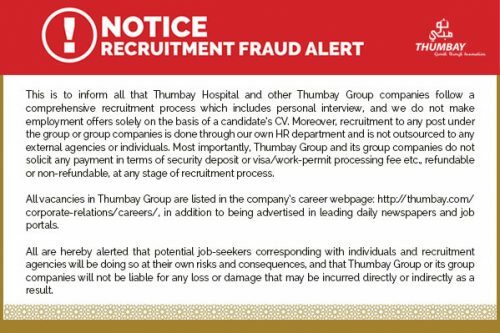 UAE-based diversified global conglomerate Thumbay Group has issued an alert on a multinational recruitment scam that offers bogus jobs in the name of Thumbay Hospital, the academic hospital chain operating under the group’s healthcare division. The group has issued notices on its career portal as well as in leading newspapers, warning unsuspecting jobseekers to be wary of online fraudsters offering jobs on its behalf. “Thumbay Hospital and other Thumbay Group companies follow a comprehensive recruitment process which includes personal interview, and we do not make employment offers solely on the basis of a candidate’s CV. Moreover, recruitment to any post under the group or group companies is done through our own HR department and is not outsourced to any external agencies or individuals,” clarifies the notice. The notice also alerts job seekers that Thumbay Group and its group companies do not solicit any payment from candidates at any stage of recruitment process. It adds that all vacancies in Thumbay Group are listed in the company’s career webpage, in addition to being advertised in leading daily newspapers and job portals. Thumbay Group has filed cases with Dubai Police and with Cyber Cell to take action against online fraudsters who promise jobs with Thumbay Hospital and cheat people of money as recruitment expenses.